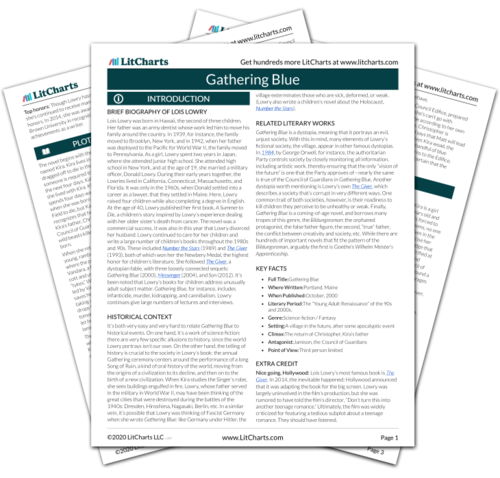 Instant downloads of all 945 LitChart PDFs (including Gathering Blue). The morning after her conversation with Thomas, Kira wakes up, conscious that something—she’s not sure what—has changed. It’s raining that day. Lately, Jamison has been inspecting her work twice a day, and seems very pleased with it. Two days before, he visited her and pointed to the undecorated area, which Kira would begin decorating after the Gathering that autumn. Kira touched the area, as if trying to feel its magic, but couldn’t feel anything. Jamison assured Kira that the guardians would tell her what they want her to weave in the empty area of the robe. Kira said nothing, but thought that the guardians’ instruction won’t give the sense of magic she needs to weave. Jamison has been spending more time with Kira. This could suggest that the Gathering is approaching quickly, and it could also suggest that Jamison is suspicious of Kira, and wants to keep an eye on her. Kira learns that she’ll be told what to weave—this is alarming for her, because Kira has always created intuitively, not according to directions. Now we start to get a sense of the guardians want from their artists: for the artists to create art or stories that carry a message the guardians want them to. Put another way, the guardians want the artists to produce propaganda. Kira’s sense that working to follow such instructions won’t provide her with “magic” also shows how such directed art, or propaganda, is in fact the opposite of real art and creative action, which must be directed solely by the artist’s own inspiration. As Kira thinks about her conversation with Jamison, it occurs to her that she can talk to him about the beasts. It also occurs to her that Matt might have seen beasts during his journeys through the forest. Kira remains intensely curious about her surroundings—whenever there’s a mystery, she feels a strong desire to solve it. Her friendship with Matt proves to be useful: he can help her solve the mystery of the beasts. Kira remains indoors studying the robe. She focuses on the patches of the robe in orange, red, and yellow: these signal fire. The robe has a pattern: impressive structures, destroyed by fire, replaced by new, even more impressive structures. Kira also admires the sections of the robe that show peace: here, there are flowers and sunlight, and humans embrace. Kira notices that even the skies, as they’re depicted on the robe, are gray or green, never blue. She longs for blue, the color of calm, and remembers Annabella telling her that there is blue “yonder.” As she thinks about “yonder,” she wonders where Matt could be, since Matt is adventurous and loves to explore the unknown. Here, we begin to understand what Lowry is getting at with her color symbolism. All the colors of the robe symbolize certain emotions: orange and yellow, for instance, symbolize fire. It’s blue, however, that interests Kira most. While Kira initially thinks that blue symbolizes calm, we can generalize this to say that blue symbolizes love and compassion—two qualities that the village, and the robe, conspicuously lack. Thomas enters Kira’s room, and tells Kira that Matt and Branch have come to the Edifice—Matt’s mother threw him out for being a troublemaker. Thomas has also come to Kira’s room to tell her that he heard the sound of a child crying again. At first Kira suggests that the sound was that of a cat or a goat. Eventually, however, she agrees to explore the source of the noise with Thomas. This time, it’s Thomas who’s suspicious, and Kira who’s initially reluctant to investigate. This suggests that Kira’s influence has made Thomas more curious and less willing to accept his luxurious lifestyle in the Edifice without question. Matt arrives at Kira’s room; he’s been finishing breakfast downstairs. Kira asks Matt if he’s ever seen a real beast, and Matt tells her that he’s seen billions. Thomas suggests that the three of them investigate the source of the noise. Matt is very excited about the prospect of this adventure, and the group goes off to explore. Matt’s answer tells Kira and Thomas nothing—clearly he’s exaggerating, or even lying altogether, about the beasts. Even so, Matt’s behavior is endearingly courageous here—like Kira and (at times) Thomas, he’s always eager to go exploring. Perhaps it’s another indication of Matt’s courage that he can seemingly walk in and out of the Edifice whenever he wants. In part, Matt can do so because Kira “cleared” him with Jamison. At the same time, Matt’s freedom within the Edifice seems to be a product of his independence and indifference to the Council’s authority. This suggests that the Council wields as much power as the villagers allow it. Arn, Jackson. "Gathering Blue Chapter 12." LitCharts. LitCharts LLC, 18 Sep 2015. Web. 23 Apr 2019. Arn, Jackson. "Gathering Blue Chapter 12." LitCharts LLC, September 18, 2015. 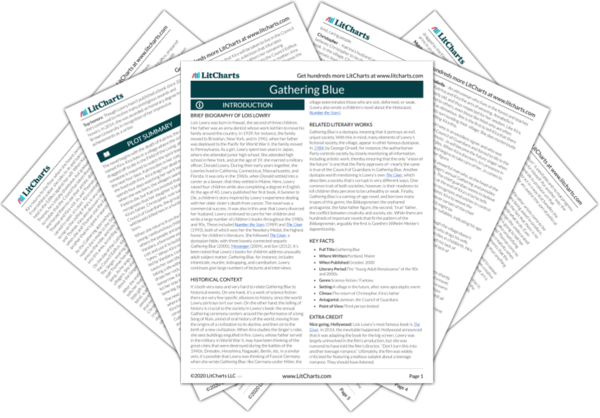 Retrieved April 23, 2019. https://www.litcharts.com/lit/gathering-blue/chapter-12.